Thank the Lord for the spiritual and physical strength walk in the heat of the night for street evangelism. My tract supplier sent me three different envelops full of tracts. A college student in a Chevy was given a tract while pulling out of the Taco Bell. Another group of college kids(wow at 30, I am calling college student, “Kids”) were from out of town looking for a steak restaurant near the college strip. I told him not really in walking distance on Cumberland Ave. Yet I gave them a Gospel tract.(A.K.A. Spiritual food) A street prostitute walked past me and I gave her a Gospel tract. Then I past by three different phone booth locations and placed tracts. The Lord just gives me impressions on my spirit to lay a tract while passing out gospel tracts. I did have some competitors while out passing out gospel tracts: the Budweiser girls. If the devil cannot just get a guy to drink alcohol, then Satan uses very attractive and scantily dressed women to lure guys into drinking. BONUS: Keep a young man in your prayers(He found one of the Gospel tracts I left in Chick Fil A in Georgia while taking the pastor to the airport over two weeks ago.) The young man contacted me via the website I stamped on the back of the tract. He needs Salvation and a good solid church home. 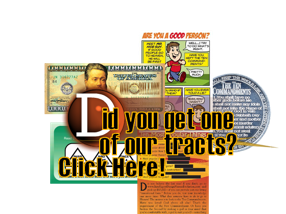 Many of you receive the business card style of tracts from Carl K. down in TX. I placed his Baseball trivia/gospel cards at a store in Knoxville which had the pocket schedules of the Cubs Minor League team “Tennessee Smokies”. It was the same size and I thank the Lord for the creativity. The small men’s group at my church went out to one of the Knoxville parks and applied some of what we read from the book, “Share Jesus Without Fear”. Out of six men and a guide dog, we broke up in groups of two. Tim and I went down by the fishing pond and met a family fishing off the banks. While we did not get to use the method from the book, we were able to share Jesus on the family’s understanding level and carry on in topics of interest: for example fishing. They did not attend church currently, so we invited them to ours if they choose to attend. No pressure. The other men shared with us of their experiences and we prayed for the seeds planted.